As early as Friday, a judge may decide whether or not the New York State Education Department can proceed to enforce new guidelines for religious and private schools. These guidelines are designed to make sure that private schools are meeting the legal requirement to provide an education that’s “substantially equivalent” to public schools. Sounds reasonable, right? Not to the unholy trinity of yeshivas, Catholic schools and inexplicably some elite private schools, like Brearley and Packer Collegiate, which are suing to prevent any oversight whatsoever. Until recently, New York State did not enforce its own education standards. And while many private and Catholic schools pride themselves on providing a high quality education that’s even superior to public schools, the consequences have been devastating for students in Hasidic and ultra-Orthodox yeshivas. In 2015, our group, Young Advocates for Fair Education (Yaffed), filed a complaint with New York City alleging educational neglect in hundreds of Hasidic yeshivas. That neglect has deprived approximately thousands of ultra-Orthodox and Hasidic children of a basic education. In our experience, on average a Hasidic boy receives just 90 minutes of secular instruction in elementary and middle school and no secular instruction at all in high school. The results are damning. The Hasidic neighborhoods in New York State are among the poorest in the state and even the country. The city has been pathetically slow to act, and so the state stepped up to revise its guidelines in an attempt to clarify them for local authorities tasked with determining and enforcing the substantial equivalency standard. On Nov. 20, 2018, State Education Commissioner MaryEllen Elia released the revised guidelines, which triggered vitriolic opposition from Hasidic yeshivas and their supporters. The guidelines do not differ significantly from previous versions. They require the teaching of the basics, such as English, math, science and social studies. Catholic and other non-public schools would easily pass any substantial equivalency test, but instead they’ve rallied to the defense of the ultra-Orthodox Yeshivas, which make no secret of the fact that they haven’t and won’t provide their students with a full secular education. It’s mind-boggling, because most of the non-Yeshiva schools would barely face any scrutiny at all. Registered high schools go through a more rigorous review by the state in order to be eligible for Regents diplomas, so they would be exempt from an additional substantial equivalency review. Accredited schools, including the majority of private schools, would be subject to only a cursory review, as the district’s substantial equivalency review will take the accreditation determination into consideration. But some Yeshivas, the worst offenders no less, are fighting to remain completely independent from government scrutiny, even as they receive millions in federal, state and local subsidies. 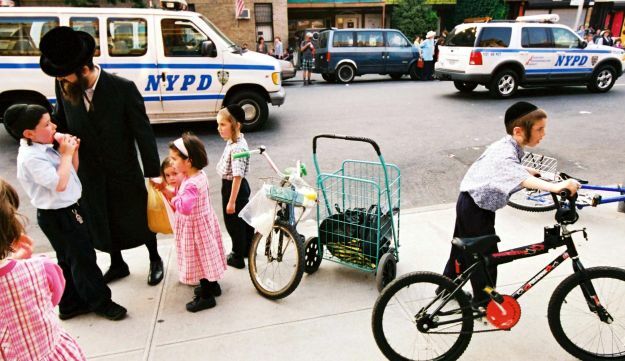 Some Hasidic Yeshivas’ budgets are covered two-thirds by government funding, and only one third from tuition. Even a full review can hardly be considered intrusive. Superintendents or their designees must visit all non-public schools once within the next two to three years and once every five years thereafter. As part of that visit, local officials would look at the instruction being done in the schools and would also collect documentation that demonstrates adherence to the guidelines. In parts of New York City, there are students who can barely read and write in English and have not been taught that dinosaurs once roamed Earth or that the Civil War occurred. Some of them are in their last year of high school. That is the claim made by a group of graduates from ultra-Orthodox Jewish private schools called yeshivas, and they say that startling situation has been commonplace for decades. Then the state stepped in with the most significant action yet in the probe. MaryEllen Elia, the state education commissioner, released updated ruleson Nov. 20 dictating how nonpublic schools like yeshivas are regulated and what students in those schools should learn, with consequences for schools that do not comply. The guidance could force yeshivas to change how they operate and what they teach. It will also hold Mr. de Blasio’s feet to the fire, as his administration is forced to ramp up its investigation into the schools. The city’s yeshiva probe began in 2015, after Mr. Moster’s group filed a complaint claiming that scores of students — boys, in particular — graduate from ultra-Orthodox yeshivas unprepared for work or higher education, with little exposure to nonreligious classes like science and history. Instead, some yeshiva graduates say, students spend most school days studying Jewish texts. Younger boys sometimes attend about 90 minutes of nonreligious classes at the end of the day, a city report found. A coalition of prominent ultra-Orthodox rabbis and community members have accused critics of yeshivas of attacking religious freedoms. This past summer, the organization, known as Pearls, handed out 10,000 posters and bumper stickers emblazoned with the hashtag #ProtectYeshivas to parents of children in Orthodox Jewish schools. The state’s guidance places the burden of investigating the schools on Mr. de Blasio’s administration. City officials are now required to visit all nonpublic schools by the end of 2021 — which will coincide with the end of Mr. de Blasio’s second term — and visit each school every five years after that. If officials find that the schools are not providing an education that is “substantially equivalent” to what public schools offer, the city can give schools more time and resources to add secular teaching. If that does not work, the city can withhold some funding it provides private schools. In an interview, the city schools chancellor, Richard A. Carranza, said that he had requested training for Department of Education employees who will visit the schools, and that he would prioritize visits to a half-dozen yeshivas he claimed have barred city officials from entry. After that, he plans to send staffers to several dozen other yeshivas that were listed on the 2015 complaint as having insufficient secular education. Though complaints about academics have focused on New York City’s yeshivas, the guidance applies to all nonpublic schools in the state, which has raised alarm bells for other groups. “We remain gravely concerned over the process, which will likely lend itself to an inconsistent and subjective review of many schools,” Jim Cultrara, the director for education at the New York State Catholic Conference, said in an interview. The mayor’s handling of the yeshiva investigation will now be monitored not only by the state, but also by those concerned about Mr. de Blasio’s recent dismissal of Mark G. Peters, the former Department of Investigations chief. After he was fired, Mr. Peters confirmed that his department was looking into whether City Hall interfered with the city Education Department’s inquiry into yeshivas in an effort to maintain ties with the Orthodox community. The issue has since been elevated, and there is a question of whether the mayor sought to tamp down probes into his own administration. Mr. de Blasio’s pick to replace Mr. Peters, Margaret M. Garnett, was already quizzed at a recent City Council hearing about whether she will continue the probe into City Hall’s handling of the yeshiva investigation. She said in an interview with The Times that she would not “tolerate or accept interference” in any queries involving the mayor. Advocates for more secular education in yeshivas found reason to celebrate last month, when Democrats seized a commanding majority in the New York State Senate. The Senate flip robbed Senator Simcha Felder, a Brooklyn Democrat, of an enviable swing vote that he used last year to add protections for yeshivas in the 11th hour of state budget negotiations. Young Advocates for Fair Education, Mr. Moster’s group, has sued the state over the so-called Felder amendment, calling it unconstitutional. Mr. Felder, who represents Orthodox enclaves of Brooklyn, declined to comment. Still, enormous obstacles remain for those who want the city to shine a spotlight on yeshivas. Few if any politicians in Albany or downstate are willing to anger the Orthodox political establishment. Urgent problems in the city’s 1,800 public schools — including ballooning student homelessness and entrenched racial segregation — will take precedence over issues in religious schools that the city does not run. To read the remainder of the article with the New York Times click here. The New York Education Disgrace – The Ultra-Orthodox Children, State Sponsored Indoctrination and What If? If a Spanish speaking community wanted to set up its own schools where everything was taught in Spanish, no English (or minimal English) and where the children were not taught Evolution, Mathematics or subjects demonstrably able to give them a chance going forward, we would be horrified. If they demanded government funding (for computers and busing), it would be unequivocally denied. In fact, the more racist among us would be claiming that they are raising future drug-runners. If a Muslim community want to live by Shaaria law (as opposed to a Va’ad or Beit Din (Rabbinical Court)), wanted to have their children taught in mosques and wanted to teach in Arabic only, we would have no part of it. The State would not even entertain the proposition. Not only would we probably be shutting the entire endeavor down, no matter how innocuous it all would likely be, we would be undoubtedly claiming that they are raising future terrorists, members of ISIS, suicide bombers; and they would likely be on every government watch list available. If the Korean communities that teach their children mostly in Korean, teach versions of Christianity mixed with a heavy weight of teaching their children English, Science, Math, Music and other well-rounded subjects, wanted to stop teaching English and wanted to raise their children only speaking Korean and living by a different set of rules, we would not allow their schools to remain open and certainly not assisted with government funding. And yet, here we are accepting (if not advocating for it PEARLS) a substandard education where children may be taught to reason using the Socratic Method of understanding Mishnah and Gemorrah (Jewish Texts) (maybe), but are not taught to work out a mathematics problem beyond grade 7. Here we are accepting the premise that because children are taught basic math through the numerological understanding of the Torah and its meanings, that it is enough. Here we are accepting, even entertaining a misleading claim that somehow 15 hours per day of religious education is enough to survive in a world (where others like secular Jews, non-Jews and others are supporting them). Somehow, we are accepting this Yeshiva double-standard? WHY? If you don’t teach science, how will your 15 children be born? Who will treat an ear infection? What if the rest of us stopped accepting your business? The children attending these ultra-Orthodox, insular and radicalized schools are taught to understand Jewish texts, a bastardized version of Yiddish spoken within their communities, and basic skills. They are given lessons in sexual education when they are old enough to procreate and not before. In nearly all cases they are not taught to assimilate. To the contrary, even a Jew not raised in that community is not “really a Jew.” In many cases they are taught the ways of the elders (namely how to survive by bilking the system (think Medicare and Medicaid). In some cases, they are exposed to sexual abuse and taught that to report is a “Moser” and therefore a sin. The children are wholly and completely indoctrinated. And, may the truth be told if tomorrow the rabbis started to teach these children the lessons of radical Islam which Martyrs people willing to die for a cause, or any other radical belief system that many of us find so abhorrent, these children would listen. Why? Because they know nothing else. If the ultra-Orthodox community woke one day and wanted to weaponize their children, there would be nothing to stop them from doing so. In fact, in Israel there are communities where this is already happening. Children are being taught by Rabbinic leaders to throw stones, attack people who don’t keep the Sabbath, create chaos. Is this so far-fetched that it could happen stateside? And when do the lines get crossed from throwing stones to throwing bombs? What if? arents for Educational and Religious Liberty in Schools (PEARLS), an organization defending parents’ right to choose a yeshiva education for their children, has filed an amicus curiae brief defending yeshiva education from the misguided and inflammatory claims contained in a lawsuit filed by an organization named YAFFED. The brief, filed in federal court in Brooklyn, was co-signed by Agudath Israel of America, Torah Umesorah and the United Jewish Organizations of Williamsburg. In its lawsuit, YAFFED challenges the constitutionality of a change in the New York education law – enacted in April, and widely known as the Felder Amendment – and uses that challenge as a launching pad for its all-out attack on the yeshiva system. YAFFED seeks to have the court supplant the Legislature, the State Education Department and the NYC Department of Education in setting education policy, and asks the court to direct SED and DOE to ignore the rich educational values students derive from their yeshiva education. According to the PEARLS brief, “YAFFED cloaks its disappointment with the Legislature that enacted the Felder Amendment in constitutional garb”. However, the PEARLS brief points out that there is nothing in the constitution that prohibits consideration of the academic rigor and educational value of limudei kodesh, referred to in the Felder amendment as “the entirety of the curriculum.” Affidavits accompanying the brief, cite examples, predating the new law, where agencies looked at the multi-faceted yeshiva educational program when evaluating if it meets the bar of “substantial equivalency” to public school education. The amicus brief also notes that the United States Supreme Court has time and again found that parents have a fundamental right to direct the educational paths of their children. That is not only a religious right, but also a fundamental parental right. Newsflash: Twitter is a pesthole of trolls. Actually, that’s news to no one. Still, most of us expect better of our elected officials when they’re on the social-media platform. Which is why Rockland County Legislator Aron Wieder’s smear campaign, on Twitter, against a local activist, Naftuli Moster, should be deeply troubling to Rocklanders. Wieder represents District 13, which includes part of the ultra-Orthodox community (of which he is a member). Many readers will recall the savage budget cuts and sweeping layoffs during his controversial time on the East Ramapo Board of Education, a school board controlled by representatives of the Orthodox community, whose children attend private religious schools known as yeshivas. Moster, formerly a member of a Hasidic community, leads the organization YAFFED (Young Advocates for Fair Education), which seeks to improve the secular education of yeshiva students. Flouting state law, many Hasidic yeshivas focus on religious studies to the near-exclusion of secular subjects such as English, math, and science. Legislator Wieder has been a vigorous defender of New York State Sen. Simcha Felder’s recent attempt to hollow out the law that ensures private-school students get the same well-rounded education that New York’s public-school students receive. Through his Twitter account, Moster has argued against Felder’s legislation. The Rockland County Board of Ethics should censure Legislator Wieder. His cyberbullying is not only a discredit to the body of which he is a member but a clear violation of the legislature’s own Social Media Guide, which states, in the section on “Social Media ‘Best Practices’ for Elected Officials,” that officials should strive, when posting on social media, to be “honest, straightforward, and respectful” (italics mine); that they should “add value to any social media discussion by staying focused on the issue” as opposed, presumably, to the character or beliefs of the individual (such as whether he is an observant Jew); and that they should not post “non-public or confidential information” such as private phone numbers. The issue of education among America’s ultra-Orthodox Jews, particularly the Hasidic community, has received a great deal of press ink over the last few months, and for good reason. The overwhelming majority of Hasidic children in the U.S., especially boys, do not receive a basic, rudimentary education. This is a fact that is repeatedly obfuscated by apologists and self-appointed spokespeople for the community, some of whom recently took to Twitter to refute all claims made – often pseudonymously – by parents whose children are in this system. They have pilloried “Yaffed,” a group of yeshiva graduates and parents of yeshiva students who seek to rectify this injustice by lobbying lawmakers to investigate yeshivas and institute the state-mandated educational standards – and lobbed ad-hominem attacks at its founder, Naftuli Moster. Shafran, a man who purportedly values a comprehensive secular education and made sure his children received one, too, nevertheless disingenuously wishes to keep a portion of his brethren undereducated at best, and illiterate at worst. In late March of this year, on the Jewish holiday of Purim, I visited my family in Kiryas Joel, a Hasidic enclave nestled in the hills of New York’s Hudson Valley. The streets were teeming with costumed children – clowns and cops, fancy ladies and doctors – and music blasted from loudspeakers. On that day, every year, the village turns into a festive, boisterous, almost-anything-goes circus; it’s a boozed-up Halloween of sorts. Inside my parents’ home, crispy homemade challah was passed around on platters, then dipped into gelatin fish sauce and stuffed cabbage, followed by a bountiful spread of fish, kugels, elongated deli sandwiches, every kind of sweet and savory puffed-pastry turnover one could concoct, and enough wine and hamantaschen for days. The men danced around the table with a buoyant fervor, and the women gave the obligatory oohs and aahs for the children’s costumes. My son dressed as an average Joe: oversized t-shirt over a stuffed beer belly, cap that read “Proud ‘Merican.” One of my brothers attempted to read the five words on the t-shirt: “KEEP CALM AND DRINK BEER.” He started, bent in closer, fumbled. His wife came to his aid. Everyone chuckled, as if watching a grown man with five kids stumble over words that a four-year-old should know is hilarious. I stood there, aghast. I was witness to a travesty of epic proportions: here was an adult – a citizen of these United States, a boy born to American citizens, a kid raised inside its borders, a dad raising children of his own – who could not easily read a sentence in the language of his land. To read the article in his entirety click here. This was submitted to us by a frequent reader and we tip our hats to that reader. We note that we are posting this without the prior knowledge of Yaffed’s Naftuli Moster. This post should not be deemed to imply that we have the support of either Yaffed or Mr. Moster, nor should it be assumed that they are readers of our posts.